Bouquets business class cannot fail to impress with its beauty and luxury. This is a very inspirational and epic tracks that will appeal more than ever to the most solemn event in human life. Flower basket is the type of 'Tale 3' is a good example of such compositions. 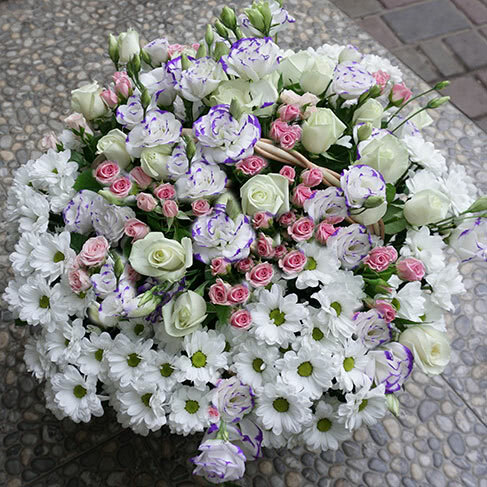 Lush bouquet in a basket consists of a huge number of various colors: here and delicate eustoma, elegant orchids, and vibrant chrysanthemums as well as the choicest varieties of roses, Alstroemeria and freesia. Supplements such an incredible team, the fresh greens for decoration. Shade compositions stand in peach, white, and delicate pink and purple tones. However, the number of flowers, their varieties and shades can be changed at client's request. Flower delivery to Kiev will delight customers. A wide range of colors will not leave anyone indifferent. Fresh gifts for loved ones. Большое спасибо за красивый букет, точнее корзину. Заказывала цветы с доставкой в Киеве на дом, осталась довольна вашими услугами. Вовремя, все как на картинке. Получательницей была моя мамочка, ей тоже ваша работа понравилась.